What follows are the last few updates from 2015’s journey with lymphoma. Next week, I’ll post the final installment — An Unexpected Journey, Part 11 of 11: Looking Back in Gratitude. These were originally shared on Facebook, but I am reposting them here for the non-Facebook crowd. I’ll do a more detailed note later, but in the meantime I have a quick request and a few memorable moments to share. First, any positive thoughts and healing energy are most appreciated today. I’m heading to the hospital this morning for robotic surgery. Dr. Ankit Bharat is using the da vinci Surgical System to biopsy or remove whatever in my chest is lighting up my PET scan. Dr. Gordon, the oncologist, is 95% certain it’s nothing to be worried about, but none of us are fans of uncertainty. A big lesson from this journey has been about letting go and trusting—one of the key reasons I am more than happy letting this great team of experts do their jobs without any second-guessing or second opinions. When I heard about Dr. Bharat’s work with robotics, I decided to Google him only because I find cutting-edge technology fascinating and wanted to know more. With three small 1cm incisions, Dr. Bharat will be able to direct the robotic instruments under my sternum to the former site of the primary tumor just above my heart. It’s mind-blowing to realize technology has advanced to the point that this type of chest surgery is considered minimally invasive. I always thought the only operation more maximally invasive than chest surgery was brain surgery. “When Harlan Dorbin passed away from a rare infection one month after his successful lung transplant surgery, his surgeon turned to Dorbin’s sister and made a promise. If Dr. Bharat’s hands are even half as good as his heart, I have every reason to be confident and optimistic. My first favorite moment happened when I received the following email from Tracy Chapin, my high school classmate. I feel compelled to share because it was so stunning and unexpected. It also gave me a great sense of peace. I wish I had her reaction on video. I’m still laughing. Yesterday was a great day that kept getting better. First, Dr. DeCamp, one of the thoracic surgeons, came by early to share Dr. Bharat’s impression that, based on what they could see, the activity in my chest is most likely the creation of scar tissue rather than an active tumor. Confirmation from the pathology tests should come this week. Shortly before 9am, another doctor from the team recruited my nurse, Katie, to help him remove the two-foot long rubber tube they had inserted near my right lung during the robotic surgery. I wish I were exaggerating about the length or the fact that it was about the width of a pinky finger. But I’m not. I’m just glad they left it in less than a day because it caused sharp, stabbing pains every time I moved. To some degree it still does and it’s been out for almost 24 hours. Curious to see what it would be, I opened envelope and found a home-made card sent over by the nurses and staff from the 15th Floor of Prentice (I was across the street in Northwestern’s Galter Pavilion on the 11th Floor surgical unit at the time). 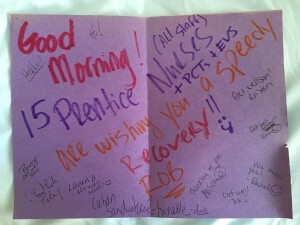 I was so touched that Annette (A-Nut Pitoń) and the team would take time to make and send a card. Fortunately, it didn’t hurt to smile because I found myself doing a lot of that. Naturally, Prentice was my first stop when they released me less than two hours later. For those of you who asked, I did make it to the Heather Horton show last night at Underground Wonder Bar. I caught the first set before heading to the Greyhound station to pick up a few couchsurfers from Ukraine. Feeling incredibly blessed and grateful today. And slightly sore. As of 6:30pm this evening, the Unexpected Journey has come to an end. No tumors. I am cured. The blessings, however, continue. When I look back on this, I will remember the unimaginable love, the laughter, the countless blessings, and the incredible personal growth. I will not remember a battle because there was no battle. I did what I set out to do. I walked with it. Learned from it. And became a better, healthier, and far happier person. Tears of joy for all of you who walked with me and never left my side. I have never experienced this kind of love. Ever. This was truly a gift. This little device may not look like much, but it’s been an important part of the journey. 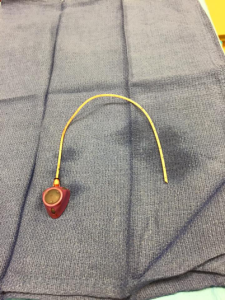 The Interventional Radiologists at Northwestern surgically implanted this port in my chest on March 11, 2015. It might seem odd to be grateful for a fancy plastic and rubber catheter that looked and felt strange bulging under the skin on the right side of my chest. But I am. This port’s nine inch path from the middle of my chest, arching up and over the collar bone, into my internal jugular vein, and down into my heart provided some deeply felt peace of mind. Part of the value of the port was not having to be stuck with a needle at least twice a week for seven months every time the nurses had to draw blood or set up an IV. But the real benefit came from the protection it provided from the chemo. The truth is, chemo is perfectly safe when it stays inside the veins. But that doesn’t always happen. Veins can burst without warning. That is exactly what happened to one of the veins in my right arm during a CT scan. Since the technicians weren’t certified to use my port, they started a regular IV in my arm to inject the contrast solution. Shortly after the test began, I was lying on my back under the scanner when I knew something had gone wrong. I suddenly felt the sensation of fluid dripping down my arm. It wasn’t until later that I found out the dripping sensation was on the inside of my arm, not the outside. That’s why my arm swelled up to twice its normal size in a matter of seconds. Had that been chemo instead of contrast, swelling would have been the least of my problems. To be fair, an accident like this with chemo is highly unlikely because what is considered a rapid infusion of Rituxan–the only chemo drug I received as a rapid infusion rather than a slow drip–still takes an hour and a half. A rapid injection of contrast, on the other hand, creates a much higher level of pressure because it happens in a matter of seconds. In any case, for the past seven months this beautiful little port minimized the likelihood of a horrifying chemo leak. That is why my deepest appreciation goes out to the inventor. Over the past 174 days, this wonderful invention withstood 545.5 hours of chemo, over 325 line flushes (to make sure the port was working properly), and countless blood draws. None of this makes my situation particularly special. Many people have ports a lot longer than six months. Once again, I am one of the lucky ones. As I walked into the Interventional Radiology Department on the 4th floor of Northwestern this afternoon, I was struck by how quickly the time has passed. It seems like only a few short weeks ago I was there to have the port implanted. Today, I had this peace-of-mind providing technological marvel removed. Tomorrow, doctors will remove the stitches from last week’s robotic surgery. Next week will be one of the first weeks since mid-February that doesn’t require a visit to Northwestern Memorial. Life returns to normal. But it will never be the same. And that is a spectacularly beautiful thing.